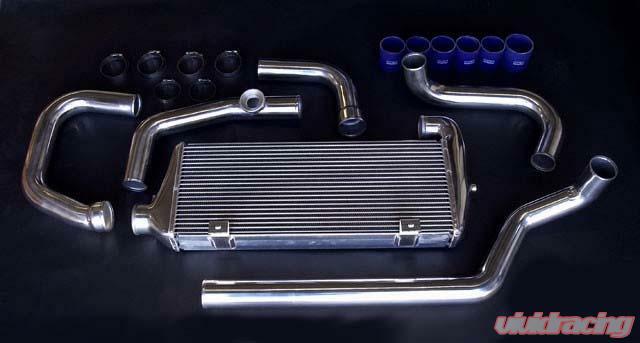 HKS Intercooler Kits are application specific upgrade kits for factory intercooled turbocharged vehicles. Designed specifically for each application; intercooler width, height, thickness and placement are calculated for maximum efficiency and performance. All necessary silicone hoses, brackets, hardware and fittings are included for a complete bolt-on installation. 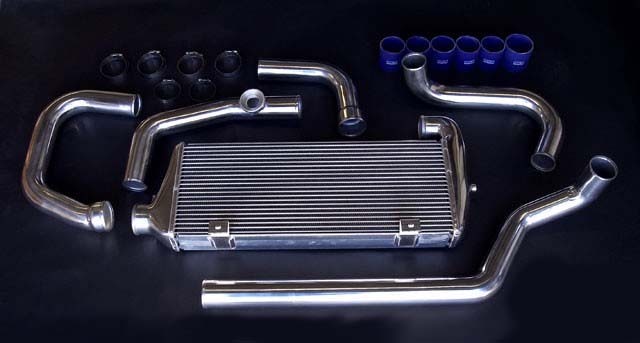 Most application specific HKS Intercooler systems and upgrade kits are CARB exempt (CARB E.O. #D-186-21). HKS R-Type intercooler kits are large front mount units that offer the ultimate in cooling capacity. R-Type intercoolers have been engineered to maintain efficiency on applications rated up to 800HP. Measuring 600mm X 302mm in frontal surface area, R-Type front mount intercooler kits maximize cooling efficiency. The 97mm thickness of the core allows for unrestricted internal airflow of pressurized air without affecting external airflow to the radiator. R-Type kits can be used with a stock turbocharger, and are recommended for highly modified turbocharger applications. Picture is for representation only, Actual product may vary. Since its beginning, HKS has been committed to providing well-integrated, reliable,and environmentally sound performance systems. Mr. Hasegawa's strong leadership, engineering genius, creativity and willingness to listen to customers are the pillars of the company's success. Monitoring consumer reaction and input on issues pertaining to material quality, external appearance, sound quality, and of course, performance, HKS stays in tune with automotive enthusiasts' needs. Moreover, HKS' products are designed to be user friendly for easy installation. Today the automotive aftermarket industry is filled with start-up companies following in HKS' footsteps. None however, can match the depth of engineering or manufacturing resources available to the talented, highly motivated and dedicated employees of HKS. For over a quarter century HKS products have been put to the test in drag racing, road racing, rallying, and top speed trials. HKS equipped vehicles have captured numerous racing championships and hold claim to a myriad of competition records using many “off the shelf”, race proven HKS components. As a result, HKS has been synonymous with “performance” in the automotive aftermarket industry for the past 35+ years.